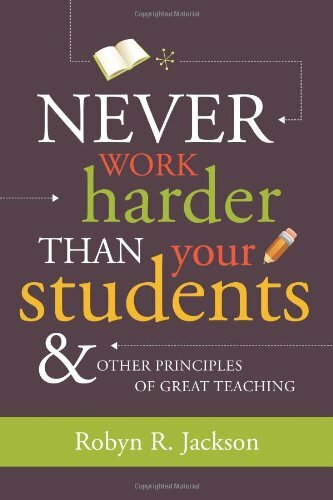 Amazon.com description: Product Description: If it ever feels like teaching is just too much hard work, here's a guide that helps you develop a more fluid and automatic way to respond to students and deliver great teaching experiences every time. Using a short set of basic principles and classroom examples that promote reflection, Robyn R. Jackson explains how to develop a master teacher mindset. Find out where you are on your own journey to becoming a master teacher, which steps you need to take to apply the principles of great teaching to your own practice, and how to advance to the next stage of your professional development. Lots of classroom tips, problem-solving advice, and tools to help you begin practicing the book's principles in your classroom right away. from Assn for Supervision & Curriculum (January 30, 2009); titled "Never Work Harder Than Your Students & Other Principles of Great Teaching"
About: If it ever feels like teaching is just too much hard work, here's a guide that helps you develop a more fluid and automatic way to respond to students and deliver great teaching experiences every time.